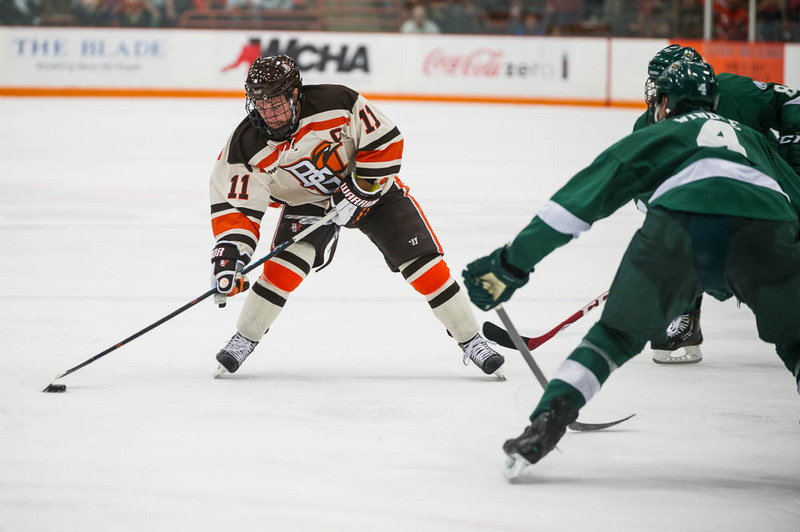 Quality special teams play enabled Bowling Green to complete a sweep of Bemidji State in the Ice Arena. 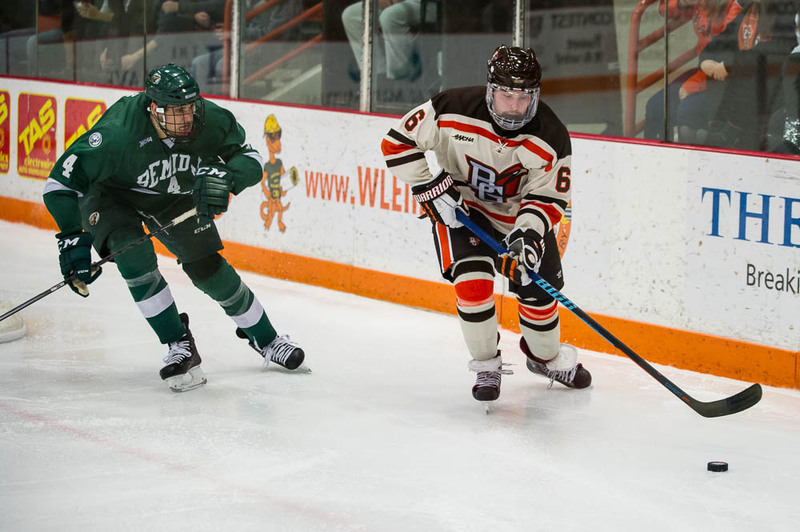 The Falcons scored a power-play goal, a short-handed goal and held Bemidji to 0 of 7 on the power play en route to a 3-2 win Saturday in the Ice Arena. Mitch McLain’s power-play goal gave BG a 1-0 lead at 16:06 of the first period and Matt Pohlkamp’s short-handed goal doubled the lead 106 seconds later. Bemidji closed within one goal twice, but the 18th-ranked Falcons held on to move to 10-3-1 overall and 7-1 in the WCHA. The Falcon power play was 1-of-4. 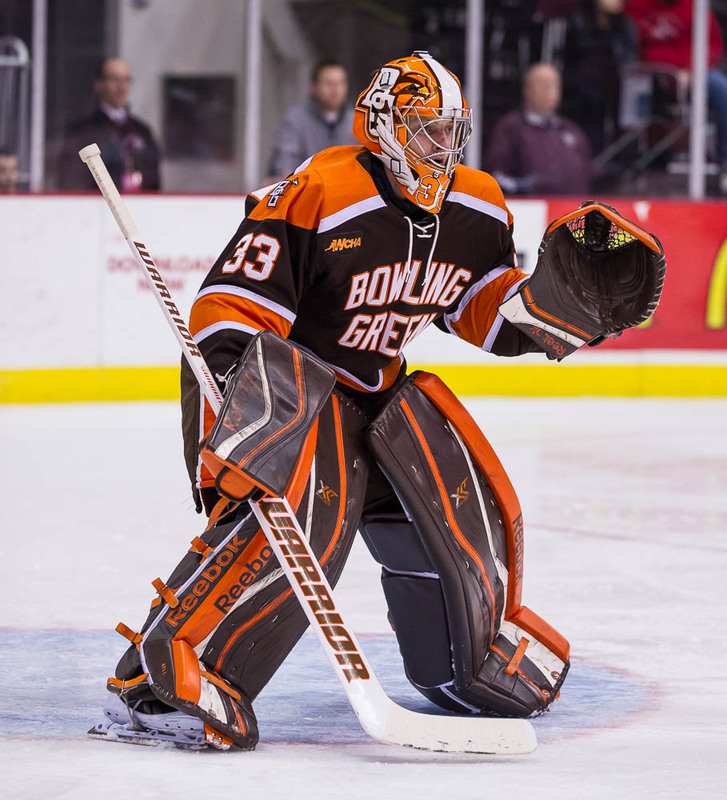 BG’s penalty-killing fought off a five-minute major and three 5 on 3 situations. “A big time checkmark for the special teams,” BG coach Chris Bergeron said. Bemidji had just nine shots in 9:09 with the extra man. BG’s penalty-killing was solid. The Falcons prevented Bemidji from making cross-ice passes, blocked shots and iced the puck when it had the chance. BG also did a good job of keeping the Beavers on the perimeter. Falcon goalie Chris Nell also was sharp when Bemidji had the extra man. “We have a great system killing penalties and everyone buys into it. Lots of poise and focus,” said sophomore defenseman Sean Walker, who kills penalties. The Falcon penalty-killing is 20 of 20 in the last five games and is fifth nationally at 92.5 percent (49 of 53). BG hasn’t allowed a power-play goal since Nov. 7. “Everyone buys in and it works,” said Walker, whose empty-net goal with 42.5 seconds remaining in the game gave BG a 3-1 lead. BG’s special teams have gradually improved during the last five seasons, and the Falcons are better suited to win games that are dominated by penalties. The Falcons are more skilled, making the power play more dangerous, and they have better players on the penalty-kill unit. BG’s power play is at 17.9 percent (10 of 56). PENALTIES: The game was tightly called with 19 penalties for 49 minutes. BG was on the power play for 8:09 — meaning just over 17 minutes of the 60-minute game were played with one team having the extra man. The teams also had a significant amount of 4 on 4 time. Seventeen of the penalties were called during the first two periods. “It completely takes the momentum away from the game,” Walker said. “The first and second periods felt so slow. Every other shift there was a penalty. It was tough to get guys going. Three times the Beavers took a penalty when they had the extra man. One came during a 5 on 3 that was a part of the major penalty. After Bergeron reminded his team after the second period to stay out of the penalty box in the third period, Walker took a slashing penalty just 18 seconds into the period. The large number of penalties also reduced the amount of ice time for the players who don’t play on the special teams. As a result, BG wasn’t able to roll four forward lines. That meant forwards Jakob Reichert, Ben Murphy, Ben Greiner and Brandon Hawkins saw less ice time than usual. MAJOR: BG forward Adam Berkle received a major penalty for contact to the head and a game misconduct with 9:38 remaining in the first period. Berkle’s major penalty will automatically be reviewed by the league office to determine if he will face further discipline. Berkle is one of BG’s best forwards. The penalty to Berkle was spotted by a linesman, who then reported the penalty to the referees during the next stoppage in play. IN CONTROL: Nell played another strong game with 35 saves in his first home start. Although he was tested throughout the game, the freshman looked in control and made the saves look routine. He was in position and had good rebound control. Bemidji finished with a 37-26 edge in shots, including a 29-15 margin over the final two periods. Nell was coming off a 27-save effort in a 3-2 at Ohio State last Saturday. “The last two starts he’s had have been outstanding,” Bergeron said. Nell had plenty of help from his teammates, who kept Bemidji on the outside and cleared any rebounds when needed. Nell had a good look at most of Bemidji’s shots. “They made my life pretty easy,” Nell said. Nell improved to 4-0. His previous starts were at Alabama-Huntsville, Clarkson and OSU. He has a 2.00 goals-against and a .933 save percentage. CLOSE CALL: BG played well in the first period, but had too many turnovers and other breakdowns during the final 40 minutes. In addition, Bemidji worked hard and played well. But the Falcons still prevailed to improve to 6-2 in one-goal games and 6-1 when leading after two periods. “I don’t think it was our best game, but we battled,” Walker said. “We know we can play a lot better and run away from teams like what when we’re up 2-0. SWEEP: The Falcons’ 7-1 league record, includes sweeps of Huntsville, Alaska (Fairbanks) and Bemidji. BG is 4-2 at home. The Falcons were 3-1 winners Friday. GOALS: The Falcons made three nice plays on their goals. McLain knocked the puck in from the right side of the crease, thanks to Hawkins’ low shot from the center point. The puck squeezed through the pads of Bemidji goalie Andrew Walsh and was trickling towards the goal line when McLain tipped it in. Dan DeSalvo came up with a turnover to set up Pohlkamp, who roofed a backhander over Bemidji goalie Andrew Walsh as he cut across the front of the net. Pohlkamp scored after dodging Walsh’s pokecheck. Valleau also made a nice play in the offensive end prior to the goal. Walker’s goal when he scored from the right circle of the defensive zone. He controlled the puck and fired it into the net after banking a shot off the boards. MINNESOTA BOYS: Pohlkamp and McLain are Minnesota natives, who live about 100 miles from Bemidji. The city is located in the north central part of the state. LINEUP: BG forward Tyler Spezia missed his second straight game because he was sick, while Greiner replaced Brett D’Andrea. BEMIDJI: The Beavers lost their sixth straight game and fell to 3-9, 2-6. The Beavers have scored just six power-play goals and have allowed a national-best six short-handed goals. Bemidji’s penalty-killing is at 77.2 percent. NEXT: The Falcons are off next weekend before traveling to Northern Michigan for a WCHA series Dec. 5-6. The Wildcats, ranked 17th, are 7-2-1 overall and 4-2 in the WCHA. 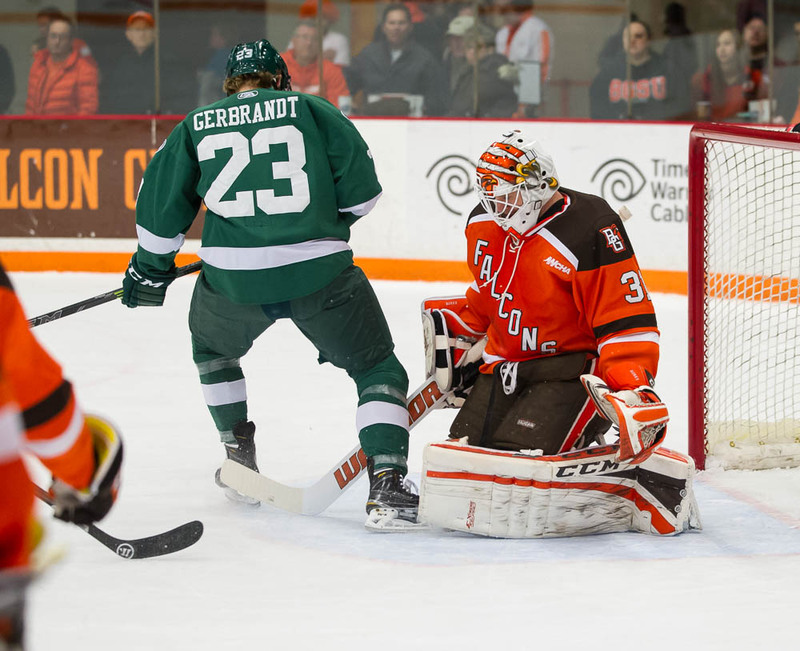 The NMU series marks BG’s final games before Jan. 1.